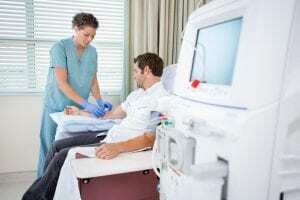 Phlebotomy Career Training is pleased to now offer their Dialysis training program Dialysis student seeking to take this class must have prior patient care experience. Students have 6 months to study at their own place. classes will meet every Wednesday and Thursday beginning on January 16th, from 8 am until 2 pm for 6 weeks. Phlebotomy Career Training is pleased to now offer their Dialysis training program. This program is currently offered for $750.00 Students may add their phlebotomy certification for $150. Payment plans are available. Please call our offices at 734-762-3220. Dialysis technician will learn about the dialyzer machines and their operation. Patients’ who are in need of dialysis are in last stage renal failure. End stage renal failure is a very serious life threatening event. Renal failure prevents the body from processing waste through the kidneys. The kidneys are responsible for filtering waste products from the blood such as urea and nitrogen in addition to other waste products. Kidney filtration is responsible for stabilizing the blood. Patients who undergo dialysis have suffered damage to their kidneys from either prolonged high blood pressure or complications due to diabetes. Classes at our school are taught by Registered Nurses. The book that is used for the class is the standard hemodialysis study guide for national certification. prior patient care experience. Students do not need an externship for the dialysis, however they do need to complete 30 blood draws for their phlebotomy certification. This special is for a limited time only. Professor Kimmel, director of the school, has complied all her years of experience as a university professor to build courses with a curriculum designed to graduate proficient and competent students in their prospective medical career choice. Professor Kimmel is a first year medical student and FNP-BC. All of our students who graduated and took the BONENT exam passed with exceptional scores in the 90% percentile range. Students can expect to earn almost double what they will make upon taking the BONENT exam. This course will cover the anatomy and physiology of the renal system, causes of renal failure, acid base metabolism and factors that precipitate renal failure. Additionally, students will learn nursing assessment of the renal patient and how to intervene and recognize serious complication associated with renal dialysis. Phlebotomy Career Training is pleased to now offer their Dialysis training program i online. Prior patient care experience is required for the dialysis portion of this course.